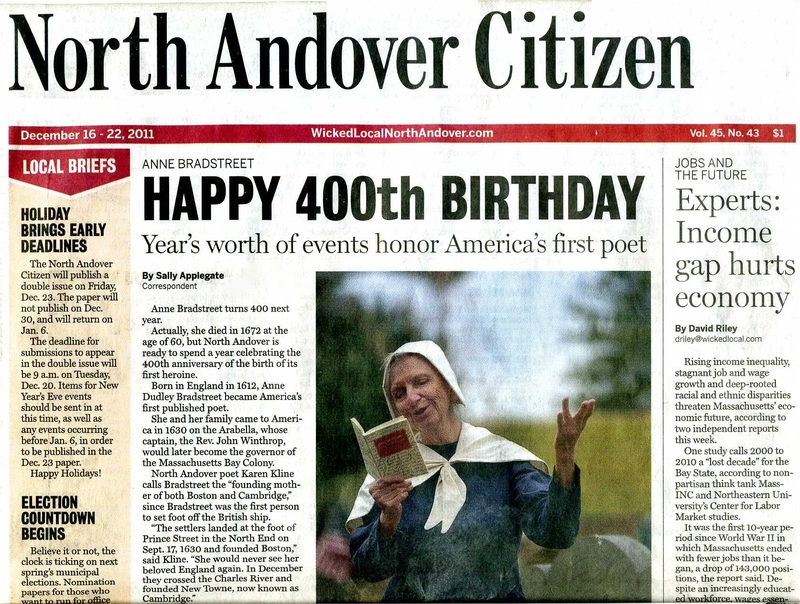 Anne Bradstreet | Celebrating 400 years and beyond! 1630 — June 12 . . .
Anne Dudley Bradstreet and her husband Simon landed in Salem Harbor, Massachusetts with Governor John Winthrop and others aboard the Arbella. 1630 — June 14 . . . Mistress Bradstreet never again saw her beloved England. Over decades, she slowly accepted America. Other emigres included Anne’s mother Dorothy Yorke Dudley and father, Thomas Dudley along with her sisters and brother. Gov. Winthrop recited a “city on the hill, the eyes of all people are upon us ” offering ways to live in the New World. All gave thanks for a safe voyage and prayed for strength in their new adventures. Here are a few statements on what poetry means to me and why I decided to be a poet . . . please send any questions you may have after seeing these links. What do you think (or feel) about the poetic word? Does it impact your life? How? Valley of the Poets Tours invites you to discover the poetic legacy of America’s four powerful poets of the past 350 years. See where they lived, worked and wrote — places of inspiration, introspection and too often, pain of loss, misunderstanding and even possible threat to life. Living in times of national and personal upheaval, these tenacious ladies and gentlemen forged ahead, leaving us their legacy of action, belief and words. 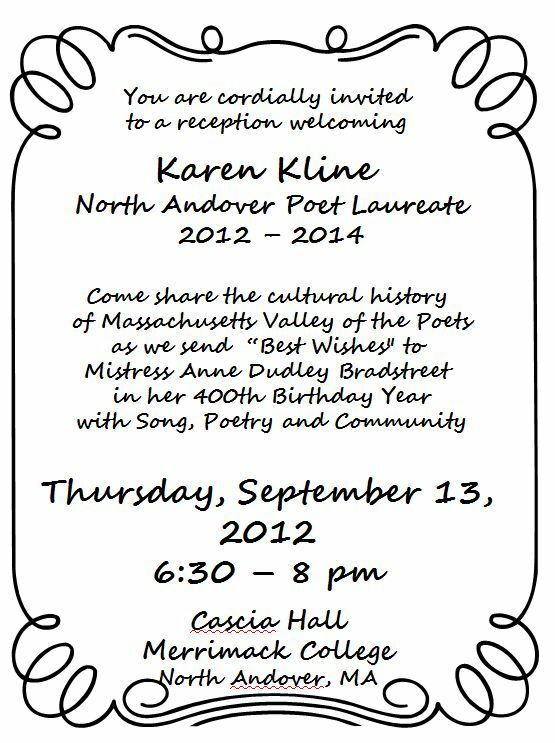 Come harvest your heritage as you visit each poet’s home here in the Valley of the Poets. Tours are being planned to begin in late August or early September, 2018. More information about dates will be published here in the next few months. 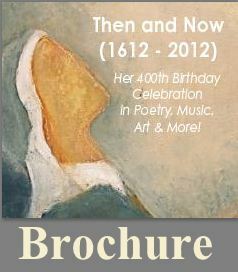 the chapbook she had edited to bring Mistress Bradstreet out into the public once more after decades of being ignored. Nancy discussed the life and words of Mistress Bradstreet, a founding mother of Andover Parish and America’s first published poet in 1650. She told the audience that in 1995, she had heard Anne’s poems read and had no idea of the poet or her lovely poems written so long ago. Even with a major in literature, Anne was a complete surprise to her. The quiet passion with which Nancy spoke of “To My Dear and Loving Husband,” demonstrated Anne’s deep devotion to Simon as his wife since they wed back in Lincolnshire, England in 1628. That Sunday afternoon in Spring changed my life completely as I meet two of the most cultured, gentle women ever. Nancy, I must thank you for sharing your love of Anne with the world and with me. Now, here is a brief overview of your very successful life of 92 years . . .
Nancy Virginia Weare of Exeter, formerly of Newburyport, Boston and Ipswich passed away peacefully at RiverWoods in Exeter, New Hampshire on December 12th at the age of 92. She was born at home on Ashland St. in Newburyport, the daughter of Laurence Weare and Helen Rodigrass Weare. An only child, Nancy graduated from Newburyport High School, Class of 1943. She went on to earn a Bachelor Degree in Fine Arts at the Massachusetts College of Art and spent 20 years as an art editor for Ginn and Company in Boston. She received a Masters Degree in Special Education and then taught at the Brown School in Newburyport for 17 years. After retirement Nancy decided to write “Plum Island, The Way It Was”, about her favorite place in the whole world, her family’s summer camp at the Knobbs. She enjoyed sailing, swimming and teaching her dog Nicki to dig for clams. Her fondest and most vivid memories were created on this special place, Plum Island. The Federal Government reclaimed the land when Nancy’s Mother passed on and she was able to find a home on Great Neck in Ipswich overlooking her beloved Island, where she lived for 33 years. 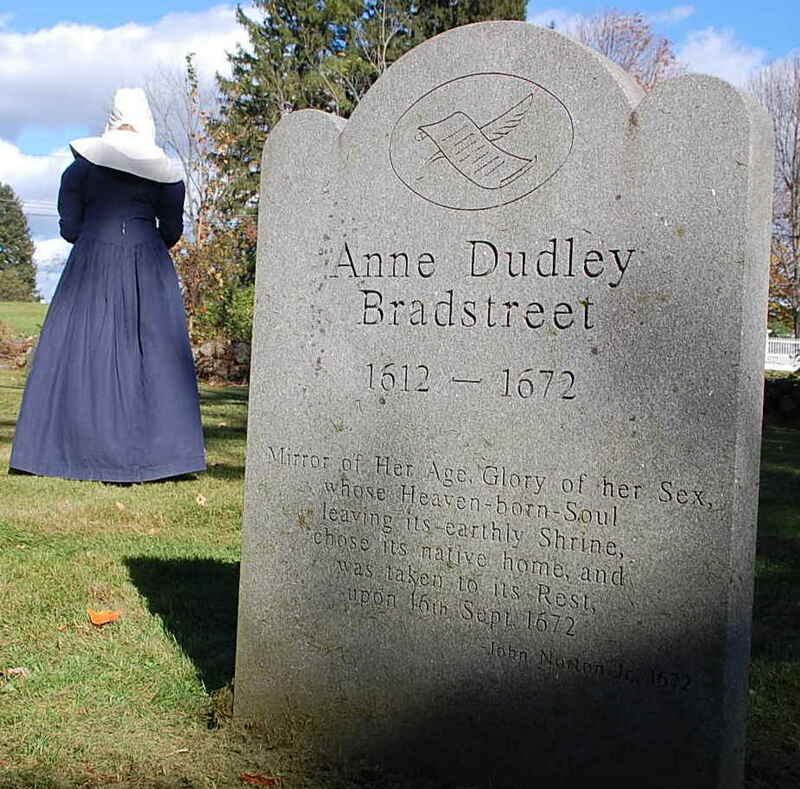 She took it upon herself to edit and publish a second book on American’s First Poet, Anne Dudley Bradstreet after hearing a presentation about her life and enjoying some of her poetry recited at Stevens Memorial Library, North Andover, in 1995. Nancy had never known of Mistress Bradstreet during her school years and believed this Puritan woman deserved much more recognition. As an author, Nancy was often invited to speak at meetings of local organizations and libraries in MA and NH. Nancy enjoyed traveling, especially to Ireland, which she visited five times. She was a descendant of Susannah Martin, one of the accused Salem Witches (1692). A devoted animal lover, Nancy rescued many dogs and cats over the years, including Liza, Ringo, Sugar Van Fleet and Murphy Brown, a white German Shepard who found her Ipswich home a safe haven in a snowstorm. Charlie Brown and Trevor, the Beagles, enjoyed living with her at RiverWoods where they received lots of love from other residents. She leaves her second cousin, Sally (Blake) Lavery, also of RiverWoods, plus many, many friends and fans. She was predeceased by her close cousins, Barbara Lagasse of Amesbury, Cary Plummer of Newburyport and Thomas Knowland of North Carolina. Following Cremation she will be buried in the family plot at The Belleville Cemetery. The date of a Memorial Service, planned for early in the new year, will be announced soon. Arrangements are by Paul C. Rogers and Sons of Newburyport. Again, Nancy, I cannot thank you enough for your passion for a woman neither of us ever met, but knew, very well. Thank you for taking time out of your busy day to come visit Anne’s site. Here is information about an illustrated poetry project called LITER – Art. With a passion for children’s imagination, let us celebrate their creativity. Since 1995, LITER – Art has been seen in six different states, two Canadian cities and in Lahore, Pakistan. 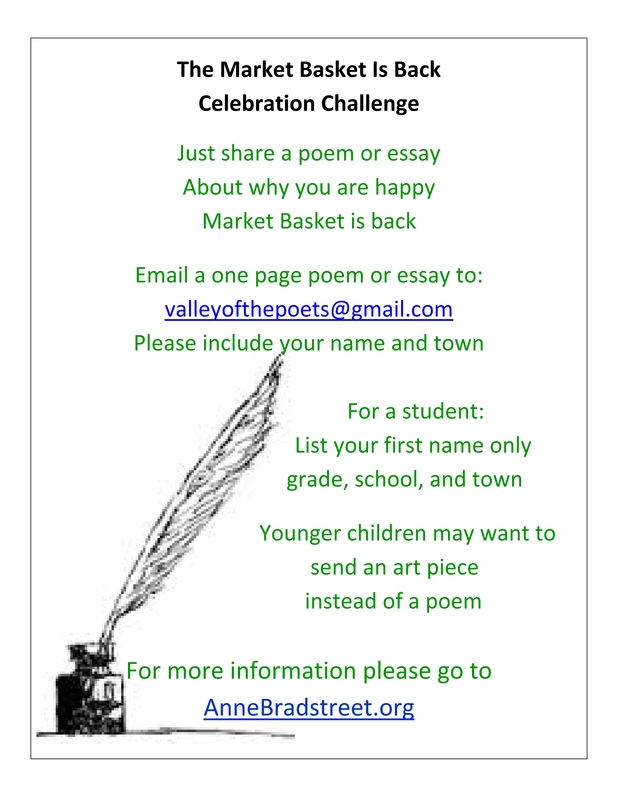 The Groton, MA students mentioned below were honoring the tenth anniversary of National Poetry Month. You may have interest in this unique concept. We certainly hope you do. Think of the inspirational art you see hung on walls everywhere. How often do you see poetry displayed in that way? Does it have value? Some believe yes, it does. Please share this message and also let us know your opinion. For the children, it is exciting! GROTON — How is world peace seen through the eyes of children? Look around Groton and the answers are everywhere, from the local pizza shop to Town Hall. “Peace looks like pizza,” according to one second-grader. “It sounds like a cat purring,” another writes. “War will be over,” notes a third-grader. To celebrate the 10th anniversary of National Poetry Month, more than 580 students at Florence Roche Elementary School are sharing visions of peace with the entire town by wallpapering 19 businesses and public buildings with illustrated poems. The concept is called LITER-Art, a way for kids to express thoughts and feelings in words and pictures. 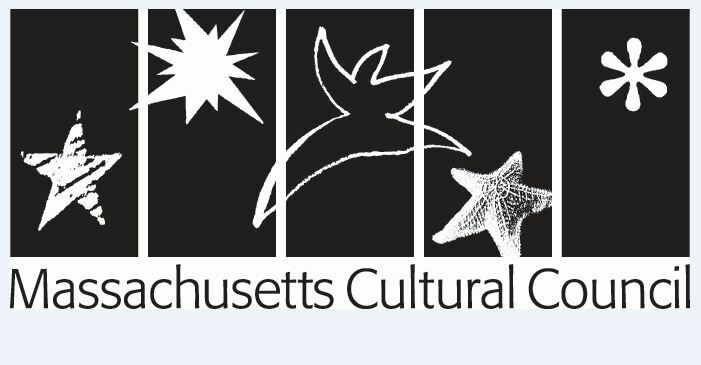 LITER-Art was the brainchild of Karen M. Kline of North Andover, executive director of American Community Think Tank — a nonprofit dedicated to promoting public awareness of the imagination of children. Memories of family road trips from Kline’s youth, driving from New York to Ohio and Canada, are peppered with Burma-Shave signs. About 7,000 of the small, wooden road signs dotted cow pastures and farm fields through America’s country roads. The series of signs advertised a brushless shaving cream, but they also became a fun part of travel, offering little nuggets of wisdom for passers-by. If American Community Think Tank had a board of directors, kids would rule the table. Kline might have brought LITER-Art to the students at Florence Roche, but it was the kids who gave it meaning, she says. Adults are not only pondering the messages, they’re also responding. Hundreds of comment cards have been pouring in, each thanking a child artist for their inspiration, says Barbara Scofidio, co-owner of N.O.A. gallery. The students will start receiving their mail in class next week. Standing with her hands on her hips, 10-year-old Alana, peruses the work of her peers. For Alana, peace means a world without war, where everyone has something to eat and something to wear. Do kids think peace is possible? “I hope so,” says Calli, 10, who thinks “prejudice” is the main problem standing in the way. “What does that mean?” Alana asks Calli. “People might have a certain view of others before they’ve met them,” she answers. One note, Alana mentions she hopes “somebody is going to write back to us.” people did! Students received over 3,000 Comment Cards back from strangers they will probably never meet but who were delighted to see and enjoy their effort.